One of my indulgences is a fancy salad from the salad bar at Whole Foods. It's an indulgence because when I'm done adding all those fantastic toppings, my salad weighs about a ton and costs more than I care to admit. One of my favorite toppings from the salad bar is roasted sweet potatoes. I love all things sweet potato (like Creamy Carrot and Sweet Potato Smoothie, Chai Spiced Sweet Potato, Vegan Chocolate Ice Cream, etc. ), so of course adding some sweetness to my salad through my old orange friend is a given. I have no idea, then, why it took me so long to figure out that I could easily and affordably combine salad and sweet potatoes at home. 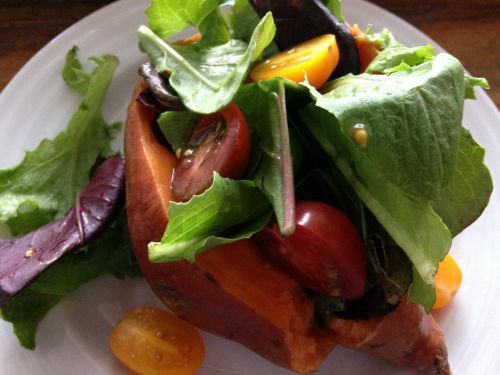 I split open a baked sweet potato and filled it with a salad that included a handful of spring mix, a handful of chopped vegetables, 6 or 7 halved grape tomatoes, a good dollop of hummus for protein. I mixed my salad up with some salsa -- my preferred salad dressing -- and ate it all up together. This was the perfect lunch to energize me as I head out to Vida Vegan Con, a blogging conference in Portland. I am so excited to connect with friends and meet new people. I am also looking forward to learning from bloggers who really have so much to offer. I can't wait to share all I learn with you. Check out Welcoming Kitchen on Facebook to see who and what I'm finding out about. I shared this with Meatless Monday Blog Hop, Slightly Indulgent Tuesdays and Wellness Weekend.